I recently built a G&G styled audio/video equipment rack. My amplifiers don’t sit in that rack they sit in the floor next to the speakers so I had to build G&G styled amplifier stands for them. Just like the equipment rack the amp stands are made from solid cherry with ebony accents with a water base finish. Way, wicked cool. Well done. I build my own valve amps. I am most definitely going to build my own cases. Very nice. Very inspiring. 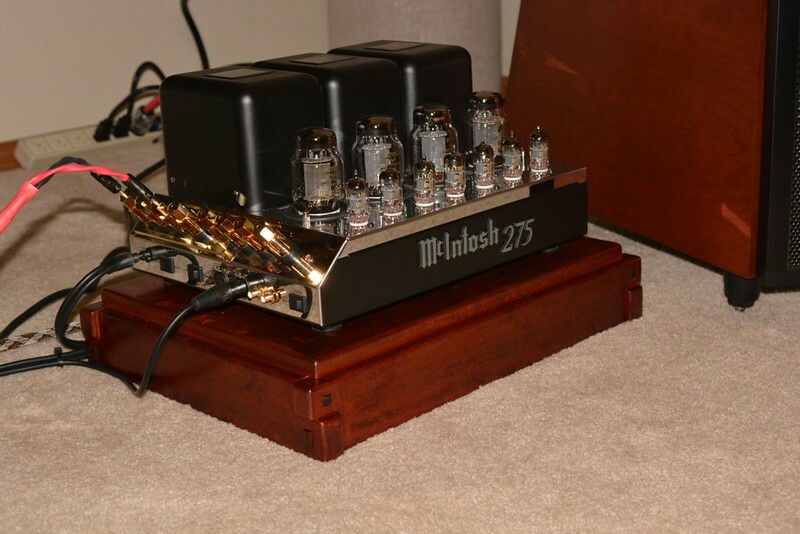 Very nice base, and way cool tube amp. Thanks guys and Jeff those amps are new, they just look like the 1961 version. It was first produced in the early sixties. I’m guessing this is a re-release…that’s the stainless case, isn’t it? It has four KT88’s for output (about 75 wpc!) and some nice phase inverters (3×12AX7) and four voltage amplifiers (I can’t remember which…time to google)... pretty sweet. I bet vocals must be awesome and those KT88’s must make a standup bass sound like it’s in the room with you. What are your speakers like, SL1800? These are version VI of this amp. I have two of them operating mono so that’s 150 watts each driving a pair of Martin Logan Summit X speakers. And yes they will put a musician right in the room with you!! you’re mad. I love you. Where do you get tubes these days. I thought they were so hard to come by. I know that the FAA is looking to the ATACS system (that’s tube based). 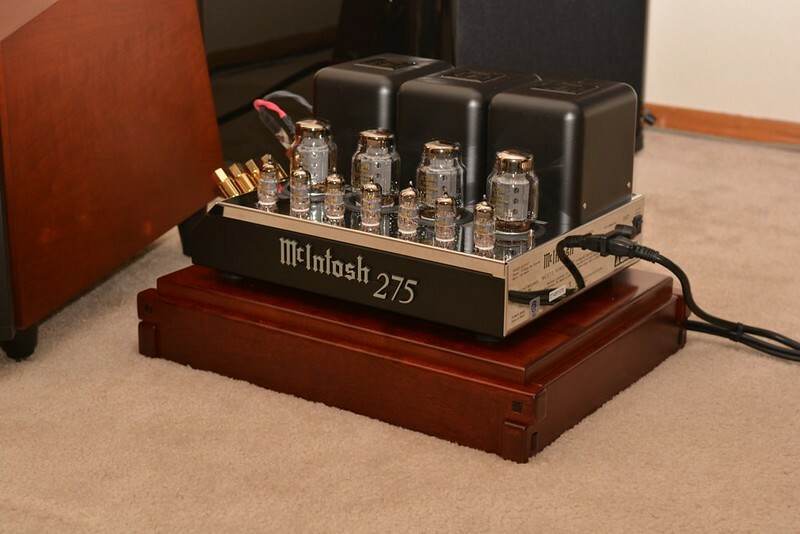 I know that you purists like the tube because it offers more pure sound… just didn’t realize they were being made again. At any rate… very cool and nice base. 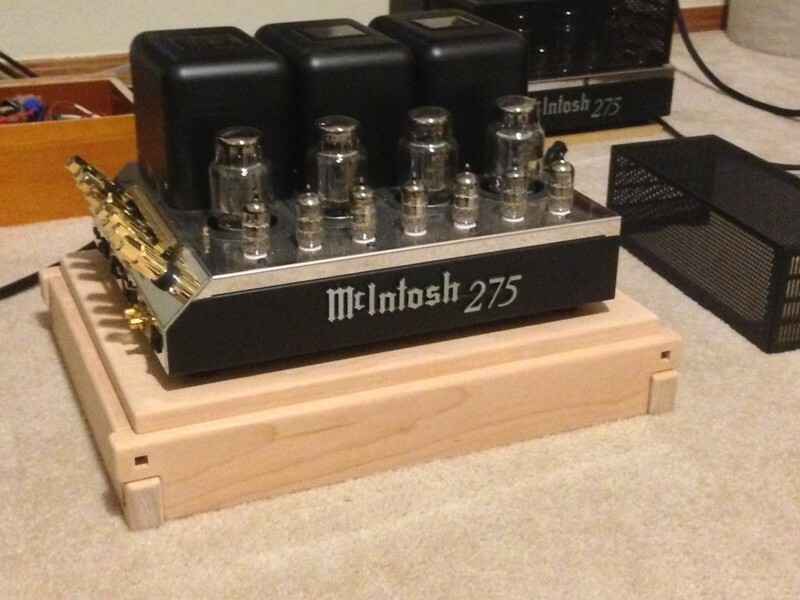 Boy that’s a nice looking amplifier—I love McIntosh! And great looking stand, too! Jeff there are several sources for tubes, even though they can get expensive. The tubes in these amps are the stock tubes, the extreme purist would suggest they need to be changes out at the tune if $500 per amplifier. I used to be into electronics, this amp is really cool. I’m shocked at the price however! I had no idea until I looked it up. This is also a great review. Wow..what a great setup…I looked at your equipment rack post as well. Great work on the pieces..I love cherry..and McIntosh! 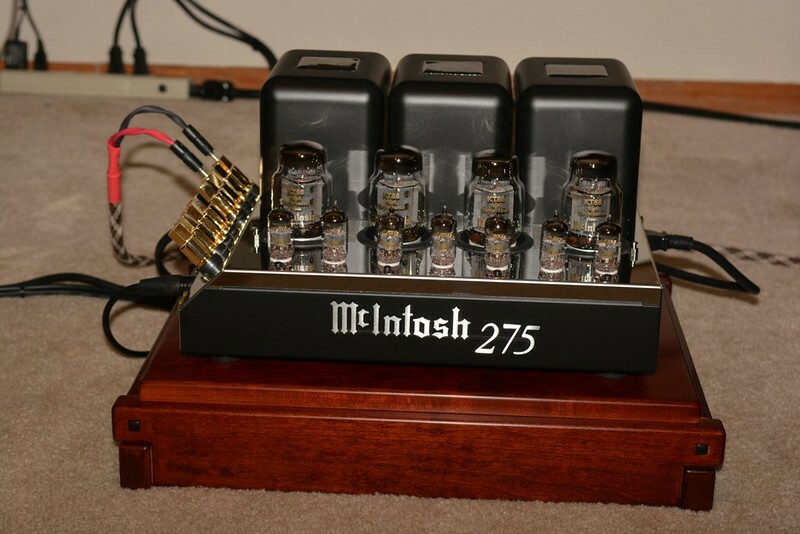 Not surprised at the price..McIntosh amps are legendary for being top notch, no compromise audiophile amps since 1949. They were ahead of the curve even back then..there weren’t speakers made that even did these amps justice..except Klipschorn corner horns! Thanks guys for all the positive comments. On another forum someone noted the black transformer covers on the back of the amp look like pillowed ebony G&G plugs!! I think he is correct, McIntosh and G&G were meant for each other.